“A Good Man Is Hard to Find”– A “Perfect” Short Story? It occurs to me as I approach writing an appreciation of this story that a reader’s ability to respond to it, let alone appreciate it, is not a sure thing anymore today. Most readers today, even some “serious literary readers,” tend to flit like flies from one dramatic/shocking sweet spot or instant take-away to another. Stories are narratives, sequences of events, one event leading ineluctably (if it’s a good story) to another. A good story has depth, resonance and tells us something memorable and important about life and people that we did not know before. Literary short stories, and Literature in general, hinges on character, rather than “plot,” which is the focus of popular commercial fiction. These characters are more than cardboard stereotypes that act as empty pawns for the unfolding of plot, which is typical of popular commercial fiction. Commercial fiction is a façade for satisfying the rather unsophisticated and base “what happens next?” appetites of an audience, and readers of this kind of fiction are titillated by plots they can’t predict or figure out ahead of time, plots that hold them in a kind of restless suspense, fueled by their rational attempts to solve the puzzle the plot presents, until the last page or paragraphs of the story or novel. Reading a literary short story, on the other hand, requires readers to be interested in humanity, including their own humanity, and life on this planet as a continuing mystery. A literary short story thus demands a deeper kind of curiosity, focus, concentration, and a willingness to go with the flow of the story to see what the vibrant believable characters are going to make of their lives and life writ large. Since so much depends on characterization in these stories and character “development” during the course of the narrative, a superior insight and writing skill is necessary in the writer, as well as a sophisticated interest in what makes people “tick,” what motivates the characters to make certain life-changing decisions. Writing these stories are very often acts of discovery for the writer herself/himself. They often begin with an interest in a particular character as a protagonist in a certain situation and hinge on the question, given who this or that character or is, what will he or she do? What will she or he discover about Life and themselves as the events of the story unfold, events proceeding directly out of who and what the main “character” is, his or her personal history, inclinations, social circumstances, and inherent strengths and weaknesses. And–most particularly–how will all of the characters, both major and minor, interact with one another? Usually this is not a foregone conclusion at the outset of a story for the literary writer, in exploring and breathing life into inner nature and qualities of the characters, “fleshing them out,” if you will, discovers these things in the act of writing the story itself. At every turn and point in the writing, the writer of a literary story is asking “is this credible and consistent with who these people are?” Is this consistent with their inner nature, and what they would do under such circumstances, that is psychologically, morally, ethically and so on. Usually considerable revision occurs in the writing process of such stories as the writer discovers–again, in the exploratory act of writing itself–more and more about these people, who for one reason or another, are of such compelling interest to her or him that long hours of reflection, unpredictable Eureka moments and epiphanies, all critical to the creative process and producing something truly original, startling and memorable, are required. These stories are rarely hastily written for the writer is after a deeper truth and revelation than merely shocking, teasing or thrilling the reader. 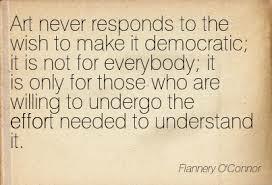 Flannery O’Connor herself said several times in her letters to other writers that she “was good for maybe one story a year,” given the time and reflection/revision involved to produce something she considered worthy of publication. 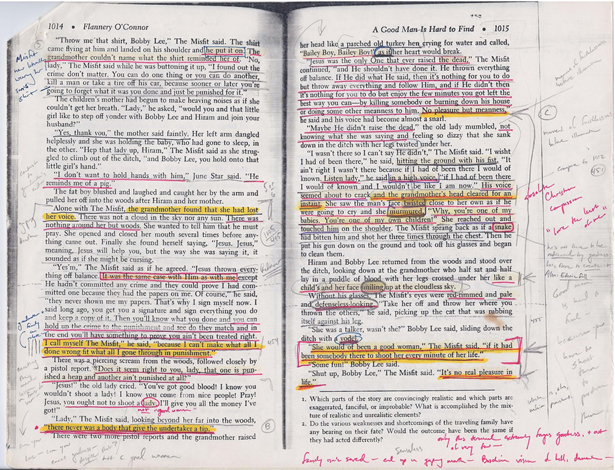 This entry was posted in Book Reviews, Literature and tagged A Good Man Is Hard to Find, characterization, creative process, Flannery O'Connor, genre, Literature, short story form, short story genre, writing. Bookmark the permalink. 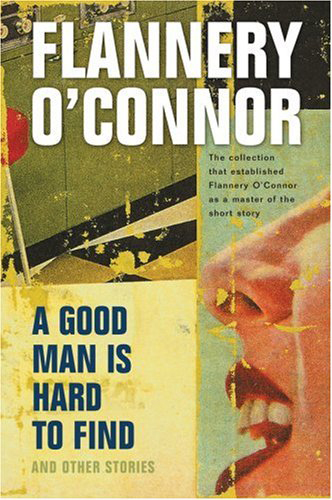 8 Responses to “A Good Man Is Hard to Find”– A “Perfect” Short Story? Thanks! Appreciate your appreciation and RT! Yes, indeed it is! Thanks for stopping by!